Mount Kailash, 6,740 m. is situated to the north of the Himalayan barrier, wholly within Tibet. It is the perfect mountain with awesome beauty, with 4 great faces. It is the spiritual centre for four great religions: Tibetan Buddhism, Hinduism, the Jain religion and the pre-Buddhist animistic religion – Bonpo. To Tibetans it is known as Khang Rimpoche (Precious Jewel of Snow) and they see it as the navel of the world. It is said that a stream from the mountain pours into a nearby lake and from here rivers flow in the four cardinal directions. The River of the Lion Mouth to the North, the River of the Horse Mouth to the east, the River of the Peacock Mouth to the south and the River of the Elephant Mouth to the West. Strangely enough, four major rivers do indeed originate near Kailash, the Indus, the Yarlung Tsangpo (Brahmaputra), the Karnali and the Sutlej. Tibetans believe that it is the residence of Demchog, a fierce looking tantric deity who lives there with his consort, Dorje Phagmo. For the Tibetans also, it is a particularly special place in that their poet saint Milarepa, spent several years here meditating in a cave. 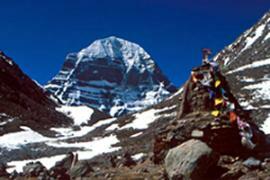 For the Hindus Mount Kailash is the earthly manifestation of Mt. Meru, their spiritual centre of the universe, described as a fantastic ‘world pillar’ 84,000 miles high, around which all else revolves, its roots in the lowest hell and its summit kissing the heavens. On the top lives their most revered God, Shiva, and his consort Parvati. 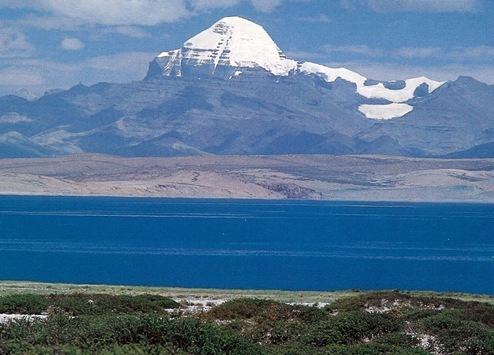 For the Jains, an Indian religious group, Kailash is the site where their first prophet achieved enlightenment. For the older, more ancient religion of Bon, it is the site where its founder Shanrab is said to have descended from heaven. It was formerly the spiritual centre of Zhang Zung, the ancient Bon Empire that once included all of western Tibet. Bon people walk around the mountain in a counter clockwise manner, unlike the other religions. Over the centuries pilgrims have constantly journeyed immense distances to achieve enlightenment or cleanse themselves of sin, braving enormous distances, particularly harsh weather and bandit attacks. The majestic Himalayas figure prominently not only in the topography of India but in its history and mythology as well. The youngest mountain range in the world, and yet the mightiest, the Himalayas are many things to many people. The Extra Night in Kathmandu will be Rs 2500 per person per night including all meals. Upgrade to 5 Star Hotel in Kathmandu only will cost Rs 5500 per person on twin sharing basis. If cancelled before 60 days of departure then charges is 10,000 INR per passenger. If cancelled before 1 to 59 days of departure then charges is 100% INR per passenger. Upon receipt of the letter/telex of confirmation, you are required to remit a deposit of INR 10,000 (per person) non refundable in favour of Dewan Travels Pvt Ltd. Bookings will only be taken as booked on receipt by Dewan Travels of the initial deposit amount. If the tour group visits Tibet, as per scheduled, the prepaid deposit may be used as a part of operating costs and be deducted from the package tour cost. The Balance payment must be paid 60 days before the departure to reconfirm the booking. Program or flight dates can be changed within our dates and a service charge of INR 1000 will be applicable. We should be informed at least one month prior to date of departure. All changes should have written communication. If you have not decided yet or wants to customize tour itinerary or hotels listed above in "15 Nights Kailash Mansarovar Group Tour Package with Dewan Holidays Rs.69990/-", then we can change the travel itinerary and make a personalized, tailor-made holiday package, especially for you. We can modify this travel package as per your itinerary, budget, duration and the tourist places you would like to visit, including transportation and airfare should be included or not. Please fill the form below to contact us.